If you've been following along, you know that I'm divorcing Microsoft Outlook and finding a new home for my contacts, calendars, tasks, and email. Before doing so, however, I made sure to back up all my important Outlook data. Before we talk Outlook replacements, I want to share a couple recent findings. First, suspecting that Outlook 2010's slow, buggy performance was endemic to my PC, I installed it on another system and migrated my PST file (which contains all my data). Turns out I was right: The program loaded in a matter of seconds instead of minutes, and email indexing worked just fine. Although I'm still peeved by Outlook's performance (or lack thereof) on my primary PC and its hideously complicated settings menus, I've probably been a little harsher than necessary. 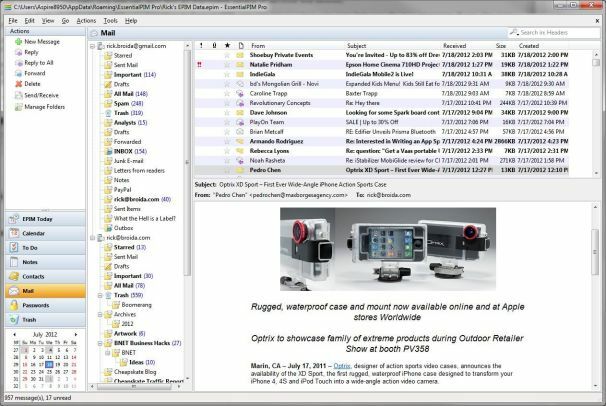 When it works, and when users take the time to learn and master its many features, Outlook can be a definite asset to a small-business user. Second, I've come to recognize that few (if any) substitute programs are quite as robust as Outlook when it comes to email, contact, and calendar management. (I still think it's terrible at managing notes and tasks, however.) I know this because I've evaluated a lot of them, and each one has just a couple little flaws that can be hard to swallow. For example, one of my leading candidates is Astonsoft's EssentialPIM Pro (newly updated to version 5.0), which reminds me of an older, simpler Outlook. It's a clean, uncluttered, and powerful information manager, one that can sync with an impressive variety of services and devices. 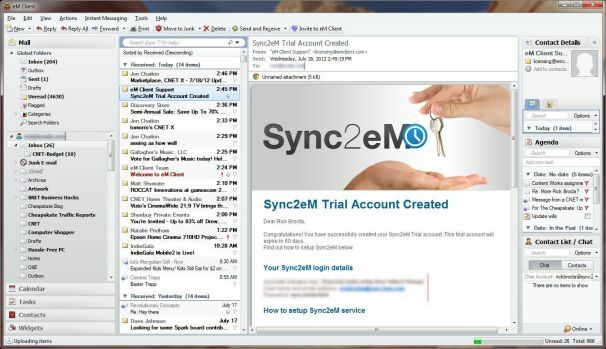 In fact, if you want to keep Outlook up and running while you transition to EssentialPIM, you can set up a two-way sync between the two programs. It can also sync with the likes of Google, Yahoo, and Tooledo, as well as Android, iOS, Windows, and even Palm devices. So what's the problem with EssentialPIM Pro? Not the price: It's quite reasonable at $39.95. But it's a bit weak on the email front, lacking a global-inbox option for multiple accounts and a right-hand reading pane for messages. Plus, it doesn't mark a message as read when you reply to or forward it -- a ridiculous oversight that inexplicably plagues other mail clients as well. In fact, that's one of my only complaints with eM Client 4 (free for personal use, $49.95 for Pro), which runs EssentialPIM a very close second. It makes simple work of importing data from Outlook (among other sources), though it doesn't actually sync with the program. And it suffers from that irksome reply/forward problem. Even so, eM Client is arguably the most modern and compelling Outlook alternative available today. It's particularly good at integrating with Webmail services like Gmail, Hotmail, and Yahoo, and it supports multiple calendars (both local and cloud). It also supports instant messaging via services like Facebook and GTalk, and the clever Sidebar pulls contact details from Facebook when available. Those are my top two picks for Outlook replacements. There are others, of course, most notably Thunderbird (though its future is uncertain), Windows Live Mail (ditto), and Zimbra Desktop. On the other hand, are desktop-based PIMs/mail managers even necessary anymore? There's a strong argument to be made for keeping all your data in your phone and synced to the cloud, without the hassles of desktop software. Obviously there's no one-size-fits-all solution, but I'm curious to hear which one works best for your situation.